These vegan chews for dogs will have your pup leaping for joy! Made in Europe with the finest vegetable-based ingredients, they're a great chew treat for dogs of all sizes to enjoy while supporting dental health. Free of corn, wheat and gluten, they're low in fat with a gentle texture that's kind on your dog's gums. Give your pooch something special when you open a pack of these fun chews! Each 3.52 oz. 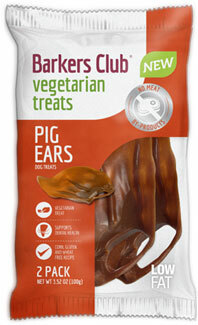 (100g) package contains 2 individual vegan pig's ear chews. $5.49 per package.